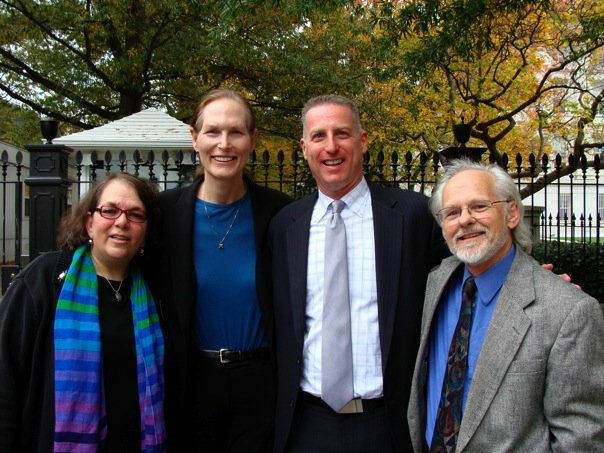 Left to right: Gabi Clayton, Marsha C. Botzer - Co-Chair of Safe Schools Coalition and Co-Chair of National Gay and Lesbian Task Force Foundation, Lee H. Rubin - Co-Chair of National Gay and Lesbian Task Force Foundation, and Alec Clayton; outside The White House before the reception which followed the signing of The Matthew Shepard and James Byrd Jr. Hate Crimes Prevention Act. – photo by Cathy Renna (used with permission). When we hopped on plane to our nation’s capital to be there when President Obama signed The Matthew Shepard and James Byrd Jr. Hate Crimes Prevention Act we didn’t even know if we were going to get in. Some 27 hours later we still didn’t know when — while standing in front of Willem de Kooning’s “Woman” triptych at the Hirshhorn Museum — we got the call from our friend Liz saying we were in. Liz Latham is a filmmaker and a friend of many years. Over the past decade she has been working on a documentary about James Byrd Jr. and the struggle to enact hate crimes legislation, first in Byrd’s home state of Texas when George W. Bush was governor and then on the national level. She invited us because she knew that we had been advocating on behalf of hate crime victims and their families since our son Bill was assaulted in a gay bashing in 1995 and subsequently committed suicide because he thought he had nothing to look forward to the rest of his life but more beatings because he was openly bisexual. He was 17. Liz said she would cover our expenses and try to get donations to cover them later. She doesn’t have a lot of money herself. She owns a cleaning company in Seattle and cleans to put food on her table and pay rent while working on the film. She said she was working with staff at Congressman Jim McDermott’s office (D-WA) to get the three of us in. In a coffee shop at SeaTac airport the next day, half an hour before our flight was scheduled to take off, she was still frantically trying to get our invitations confirmed. On a cell phone in the Milwaukee airport three hours later we were still frantically trying and it was beginning to look like we would not get in after all. A word about flying. Despite all the hassles, the waiting, the cramped seating and the Petri dish of germs that airliners are, I love flying. When it comes to looking out the window at the ground below, I’m like a wide-eyed kid. We arced north by northeast and then south by southeast over parts of Canada, over Minnesota and Wisconsin. We lifted and dropped in and out of cloud cover. Fluffy white clouds cast black shadows on the ground. The earth below was a patchwork of brown, green (a very dull green) and orange. A crazy quilt of sparsely populated country stretching for miles and miles and miles, beautiful in a stark and dreary way, although I can’t imagine living in such isolation. I brought a book to read, Sherman Alexie’s Flight — what an appropriate title. Great book, but too easy to read; I finished it and had nothing to read on my way home. We landed at National at 10:05 Eastern time. (The official name of the airport is Ronald Reagan National Airport but nobody in Washington calls it that, at least none of the people w know.) It was raining. Our taxi driver was surly, and he couldn’t find our hotel. Liz thought he was trying to take us out of the way to run up the meter. He made three u-turns in a four-block area, but did finally get us where we were going, the Windsor Inn, a lovely little bed and breakfast near Dupont Circle with a cat named Mimi (aka Mona) in the lobby and a charming Frenchman named Jamie working the desk in the evening. Wednesday morning we went with Liz to shop for a video camera. She had not wanted to bring her camera equipment on the plane without knowing if she would have something to film. Then we went to visit our friend Cathy Renna, whose office was two blocks away from the camera store. Cathy used to be a primary spokesperson and media person for Gay & Lesbian Alliance against Defamation (GLAAD) and now runs her own communications company, Renna Communications. Her clients include The Family Acceptance Project and The NYC LGBT Community Center. Cathy is a dynamo. She and Liz had never met, but they hit if off immediately. By noon we had heard back that the White House was not able to let us in. Liz could go as a member of the press. She had to go. The signing was at 2 o’clock, and she had the chance to film it, which was a great opportunity — it was the dream ending she had wanted for her film. 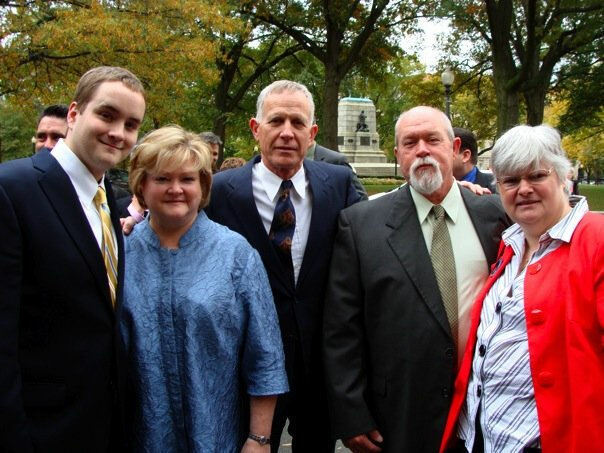 Left to right, outside the White House before the reception following the signing of The Matthew Shepard and James Byrd Jr. Hate Crimes Prevention Act: Logan, Judy and Dennis Shepard, Matthew Shepard's brother and parents; Jim and Elke Kennedy, parents of Sean Kennedy. – photo by Cathy Renna (used with permission). We still don’t know who pulled what strings, but though we’d missed the signing we were in for the reception. We grabbed a taxi back to the hotel. Jamie the desk man met us with a thumbs-up. He’d already heard from Liz, and he was excited for us. I put on my sports jacket and a tie. That’s as formal as I ever get. I don’t own a suit. Liz came down to our room looking terrific in a beautiful black pinstripe pant suit. Gabi had dressed earlier in a basic black wool dress with a blue silk scarf. We were off to the White House. The driver dropped Liz off at the press gate and drove us around about four blocks to the entrance we were supposed to use. There was a huge crowd at the gate. The first person we recognized was Marsha Botzer from Seattle, founder of the Ingersoll Gender Center. Cathy Renna was there taking photos of everyone. We hugged Judy Shephard and met Dennis and their son Logan, and we met Elke Kennedy and her husband, Jim. Elke is the mother of Sean Kennedy, a gay man who was murdered in a hate crime. She and Gabi had been in touch by email and telephone for a couple of years but had never met in person. It was a festive gathering, everyone chatting while waiting to be let in. Thankfully the predicted rain had not shown up. It was pleasantly warm. We formed a ragged line to get through the first security check. The last people to show up were a man who looked very familiar and his date, a striking blonde who also looked familiar. I was sure I must have seen them on television or something and thought at first they might have been actors — faces you recognize but can’t identify. I later found out he was Joe Solmonese, Executive Director of the Human Rights Campaign, and she was the singer Cyndi Lauper, a longtime supporter of the Matthew Shepard Foundation. About every 10 to 20 feet as we walked the halls we were greeting by Marines in full dress uniform and uniformed maids and butlers who greeted us and welcomed us to the White House. We went with the flow of the crowd until we reached a flight of stairs. Gabi said she needed to rest a moment before going up. A young Marine standing by asked if we needed an elevator and escorted us farther down the hall to an old fashioned elevator with a uniformed operator, an elderly black man who said he’d been on the job since 1957. Imagine what tales he has to tell. When the doors opened one flight up the same Marine was standing there to greet us. He must have run up the stairs but was not in the least winded and seemed to have been standing there all along. He directed us to the reception area where everyone was standing around talking. Another Marine was playing soft music on a piano, and drinks and hors d’ouvres were being served. By the time we made our way to the bar it was time for everyone to move into the next room where the president was to speak. A servant took our wine away (I’d had only one small sip) because apparently no one is allowed to drink alcoholic beverages within a certain distance of the president. At least that’s what someone told me, which seems weird considering the much ballyhooed “beer summit” between President Obama, Professor Louis Gates and Cambridge police Sgt. Joseph Crowley. It’s not the George Bush tee totaling White House any more. We were jammed into the East Room, a room much too small for the crowd, where we sweated and talked to our neighbors while waiting on Obama. It felt ridiculous to stand there like adoring fans waiting for a glimpse of the president. But somehow it was reassuring to know that Senator Arlen Spector and Speaker of the House Nancy Pelosi and Attorney General Eric Holder were jammed in with us. Gabi and I were standing next to PFLAG Executive Director Jody Huckaby, whom we had recently met in Olympia. We talked to him about our local PFLAG chapter and Referendum 71 in Washington State. 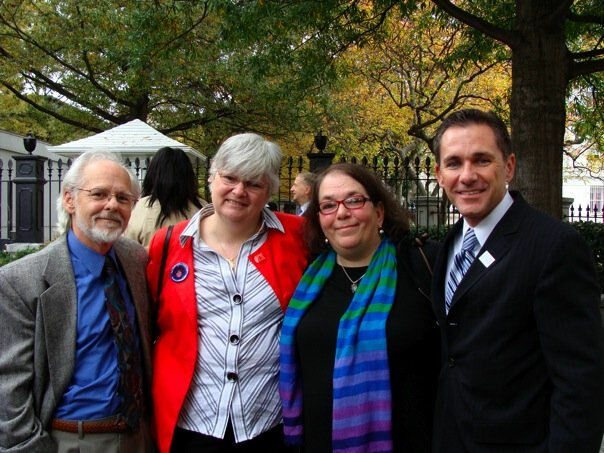 Left to right, outside the White House before the reception following the signing of The Matthew Shepard and James Byrd Jr. Hate Crimes Prevention Act: Alec Clayton, Elke Kennedy, Gabi Clayton, and PFLAG Executive Director Jody Huckaby. – photo by Cathy Renna (used with permission). 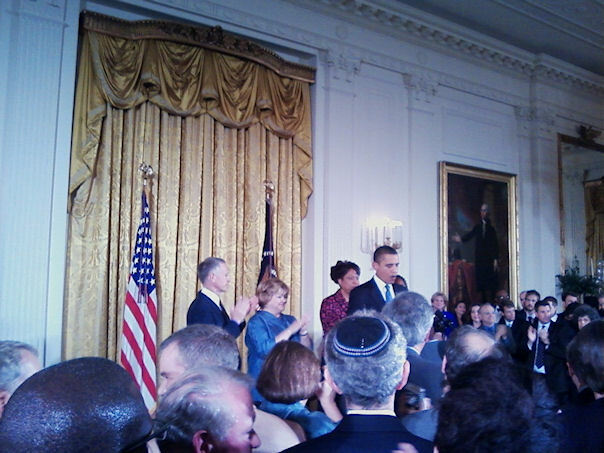 President Barack Obama speaking in The East Room of the White House at the reception after the signing of The Matthew Shepard and James Byrd Jr. Hate Crimes Prevention Act. Standing with him are Matthew Shepard's parents, Judy and Dennis Shepard, and James Byrd Jr's sisters Betty Byrd Boatner and Louvon Harris. – photo by Gabi Clayton (used with permission). After his speech Jody introduced us to a reporter from The Advocate, who asked a few questions and took notes. Then we all adjourned back to the reception area where we finally got to partake of the drinks and hors d’ouvres and visit with some of the many guests. I stood for a long time next to Nancy Pelosi wishing I could talk to her about health care, but there were too many people trying to talk to her. As it was time to leave, the same Marine found us and asked Gabi if we needed the elevator. She thanked him and told him she would be fine on the stairs as long as there was a banister. It was dark and raining when we left the White House and shared a taxi with Jody to the Human Rights Campaign office for another reception. We had another surly taxi driver who, when Jody tipped him, said, “That’s a shoddy tip,” and then reluctantly acknowledged that he had miscounted. At the HRC reception we heard an inspiring speech by Rep. Barney Frank, whom I mistakenly addressed as Senator, and I made smart-alecky remarks to Candace Gingrich about her brother Newt. I told her that I also had a rabid, lunatic Republican brother. I don’t remember exactly what she said, but she laughed, and she thanked me for coming when I told her why we were there. After this reception we went across the street for a late dinner at a hotel restaurant (I can’t recall the name). Jim and Elke Kennedy came in and joined us, and we had a very enjoyable visit with them. Finally, another taxi ride back to our hotel where we chatted with Liz for an hour or so while unwinding. We packed and briefly slept before getting up at three o’clock the next morning to fly back home. The flight home was grueling, two hours from D.C. to Atlanta, then after a two-hour wait —and being misdirected to a gate in the wrong terminal as far as you could go and back again for a five-hour flight to Seattle. For most of the trip we were above clouds and could not see a thing, but somewhere over Colorado or Nevada the clouds cleared and I saw endless expanses of uninhabited desert and mountain areas and lots of snow in the foothills of what must have been the Rockies. And then nothing else to see until we dropped below the clouds coming in to Seattle, where the vegetation and the fall colors were richer and denser than anything I had seen across the wide country. It was good to be home.